This page summarises Investments to End Poverty Chapter 2. Domestic: half of all developing countries experienced average growth of over 5% a year from 2000 to 2011; the other half experienced growth averaging 2.5%. International: total international resource flows to developing countries increased from an estimated US$1.0 trillion in 2000 to US$2.1 trillion in 2011. In 2011, government spending across all developing countries totalled US$5.9 trillion, almost three times the estimated US$2.1 trillion in international resources received by developing countries. Government spending per person is one of the most pertinent indicators of a government’s capacity to serve its citizens and reduce poverty. Government spending per person is lowest in sub-Saharan Africa, South and South-East Asia. Some 82% of the world’s extremely poor people live in countries where government spending is less than PPP$1,000 per person per year, compared with PPP$15,025 across OECD Development Assistance Committee (DAC) countries. More than 100 million people in extreme poverty live in countries where it is less than PPP$200. Official development assistance (ODA) remains the largest resource flow for most countries with the lowest domestic resources. It accounts for almost two-thirds of flows to countries with government spending of less than PPP$200 per person each year. In contrast, most foreign direct investment (FDI) is received by countries with more domestic resources and lower poverty rates. Although government resources per person are expected to grow in almost all developing countries, rates will vary. Estimates suggest that the developing countries with the lowest government spending will see the slowest growth in spending. Even countries with rapidly growing resources are starting from a low base and may face non-financial challenges to deliver basic services. Shifts in international resource flows since 1990 have been driven by growth in FDI and remittances. Disbursements of long-term loans account for the largest resource flows to developing countries in 2011, totalling US$530 billion, followed by FDI (US$472 billion) and remittances (US$343 billion). Gross ODA totalled US$149 billion in 2011. But the mix of resources flowing to developing countries has changed dramatically. 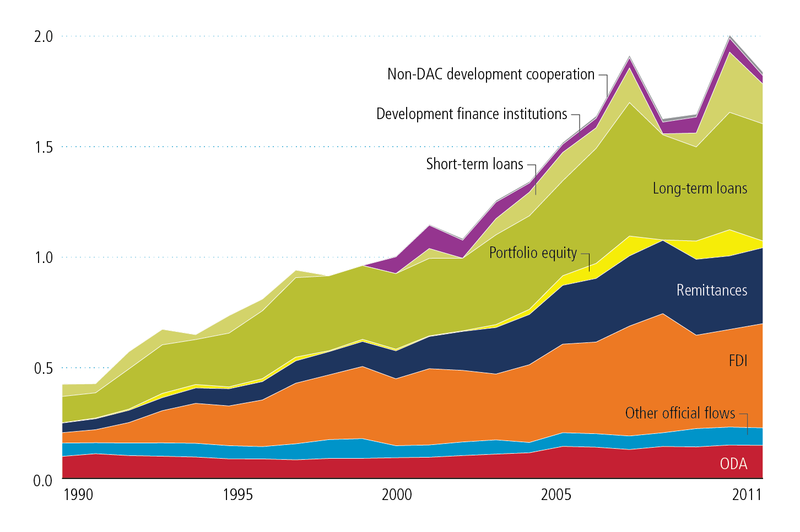 In 1990, gross ODA from all donors was the largest resource flow for 95 developing countries, but by 2011 this had halved to just 43. Source: Based on data from a wide range of sources (see methodology). Large volumes of resources leave developing countries and these are largely not productive investments in other countries, but reverse flows in the form of repayments on loans or returns on investments leaving the country. Capital repayments on long-term loans to developing countries totalled two-thirds of all loans received in 2011. Illicit outflows represent resources lost from developing countries, reduce the resources available to domestic institutions and undermine the benefits of trade. All available resources need to be mobilised: all investments – domestic and international, public, private and commercial – can contribute and should be mobilised to end poverty. The international community has a critical role: the international community should act as a backstop to developing countries facing domestic resource constraints. Aid is the main source of international finance intended to explicitly promote development. At the same time, the international community should support countries with growing domestic resources to overcome capacity constraints and strengthen service provision. Better information is needed: financial resources can be more effectively harnessed to reduce poverty if better information on the volume, purpose and distribution of these resources to developing countries is more readily available.